Chef Massimo Bottura opens canteen in Modena. At Self Service Ghirlandina for sure you cannot eat the sophisticated dishes of Osteria Francescana, however you can tell your friend that you ate at Bottura’s “Restaurant” in Modena. Moreover you can sample dishes from the Modenese tradition like passatelli, tagliatelle, tortelloni, tortellini, prosciutto di Modena, ragu’, and zampone. The average meal is 10 euros or less, what are you waiting for? Chef Massimo Bottura opens a canteen in Modena, being part of the food for soul initiative to reduce food wastage and help social inclusion. Self Service Ghirlandina, the name of the canteen is situated at a historic and very popular place, near the cathedral in Modena. This is what I had: Pappardelle con sugo d’oca only 4.5 euros. If you have never heard about communities to fight food waste through social inclusion, then here are some interesting facts about food for soul. Food for Soul is a non-profit organisation founded by chef Massimo Bottura & Lara Gilmore. Do you know that food waste is a huge problem and that there are food sources that can be used more effectively with the right knowledge and education? So, what are the main features of this initiative aiming to combat food waste? Many partners collaborate with the main aim to raise both the awareness on issues related to food waste and social isolation. This happens not locally but around the world. Of course, not all local communities are the same, therefore the local needs are being considered and these needs can lead to the creation of brand-new possibilities to be examined, never considered before. Special attention is given in the renovation of neglected spaces and their creative transformation into inspiring community kitchens, where people that feel socially vulnerable can feel the welcome atmosphere and experience the meals created with food surplus. These special meals are prepared by renowned chefs, with emphasis given on making them both delicious and healthy. Social issues such as hospitality and dignity are given a lot of importance. Social Tables or “ Refettorios” are another service highlighting the need to create both an active and a conscious as well community. Social Tables Ghirlandina were launched 3 years ago, in 2016 and once per week, each Monday this community kitchen serves about 70 persons in need from the local community. The concept of theme meals is to be inexpensive. But their low cost does not mean that they are not delicious or healthy. On the contrary besides these features there is a special atmosphere as local artists, designers and even actors are being involved to create a community being well-conscious. In financial world gold is a precious metal with many desired features such as a hedge for inflation. But bread can be gold too.” Bread is Gold” is a book written with many recipes and the combined effort of over 50 chefs who got the idea to write how to transform in many cases neglected ingredients and turn them into a meal both delicious and most importantly healthy. This book has been written is many languages, some of them being English, Italian and Spanish. Buying the book is another way to increase the social impact of the food for soul initiative. Doing so helps the food for soul initiative to open even more Refettorios and Social Tables around the world. Self Service Ghirlandina in Modena is a canteen with a special social purpose. Being part of the food for soul initiative it is also a part of a community which wants to decrease drastically food waste and at the same time decrease the impact of social isolation. The location near the cathedral in Modena has the potential make it popular. Author Emilia DeliziaPosted on 11 April, 2019 11 April, 2019 Categories Gourmet food tours in Italy, ModenaTags how to eat at bottura's Modena, Modena cheap eats, self service ghirlandina, where to eat in ModenaLeave a comment on How I Ate at Bottura’s for 10 Euros…Well Not Quite. Grand Hotel Majestic gia’ Baglioni is a beautiful hotel in a perfect location and with friendly staff always ready to serve its guests perfectly. It is a top-notch rated hotel in Bologna positioned at the center of an 18th- century palace. Its interior furnishing suggests an ancient style which makes the hotel look artistic and decorated. I spent four nights here while I was working in the city and I had a good experience. While here, make sure you take various food of great choice including breakfast buffet, juices, and delicious fruits. The beds are incredibly comfortable. The prices charged at the level of a luxury hotel in Bologna but still affordable for one or 2 nights. I enjoyed every moment of my time when I was there and felt as if I was at home. Majestic gia’ Baglioni hotel is located in the center of Bologna, a few meters from Piazza Maggiore and the well-known Two Towers and Bologna Central Train Station. The hotel neighbors Navile, Santo Stefano and Savena. The landmarks of the place are the city center of Bologna 10 km from the Airport, and there is also the Ducati museum. The hotel offers spacious rooms with decorated interiors, with watercolors that makes its outlook one and only best hotel in Bologna. The furnitures of the Grand Majestic hotel usually look heavy, oaky and ornamental. It is air-conditioned and offers entertainment services to its esteemed customers through the provision of satellite Television. The hotel offers bed and breakfast, country house, parking services and garage which extra charges are incurred when it is reserved for its customer. Its restaurant serves drinks, snacks, and other foods. Free Wifi services, private parking and. The Grand Majestic Hotel has the following facilities: Airport collection, bar, business facilities, car charging places, free wifi and parking, gym, pool, meeting facilities, smoking areas, childcare, and spa. While there at hotel Majestic, I found out that they are a lot to its guests by providing in-room accessibility services, wheelchair accessible rooms, accessible bathrooms, and roll-in showers. The design of the hotel is impressive and conveys a luxurious lifestyle. It is stylish and the rooms were neat and clean. Its staff is friendly, and caring. The Starhotels Excelsior is a remarkably one of the best hotels in Bologna, I just visited there for a weekend. The hotel is situated opposite Bologna Train Station. I enjoyed the friendly staff members, American breakfast I was served and the modern interior of the hotel. Its rooms look large, impressive, with a carpeted floor. The Starhotels Excelsior is strategically located opposite to the Bologna Train Station. Even though the hotel is opposite to a railway station, the place is quiet and not noisy at all. The average price of the hotel is relatively cheap and affordable for many people. The hotel reveals one of the classic rooms and a selection of traditional food which I was served with. The rooms were clean, the bed was confy and the food and drinks were delicious. It made me enjoy being there as a guest. The personnel here were really loving and friendly and gave me an easy time talking to them since they speak in English which is a language I understand best. The Starhotels Excelsior is beautifully decorated with modern interiors in it, its floor is carpeted on wood which makes it look superior. Its rooms are spacious and air-conditioned to give a fresh cool air into the hotel. The facilities offered at Starhotels Excelsior includes parking, free Wi-Fi, food and drink, internet services, pets are allowed on request and are chargeable, reception services, entertainment, cleaning services, and business facilities. The other best hotel in Bologna is the Metropolitan hotel which for now I have visited it twice. It is a five minutes walk from Bologna’s main square. It is suited to modern facilities in it and has spacious rooms. Guests enjoy visiting this place, especially for cocktailing parties on the rooftop and view the hills of Bologna which looks amazing. When they’re at the Metropolitan Hotel, you will enjoy strolling around the Bologna’s historic Centre and have a tour of tourist attractions. It is well positioned for the airport shuttles and stations to stop over this place. The interior design is fitted with enough space, good lighting capacity, nice colors, and nice shaped rooms. The rooms are neat and always clean which makes the guests face the beauty of the hotel and feel good. The facilities offered by Metropolitan Hotel include internet services, parking, bathroom, outdoor furniture, Kitchen, room amenities like sockets and clothes rack, living area, entertainment, food and drinks, cleaning services and reception services. All these activities are bearable to all the guests. The lighting of the room is quality and has a television with sky channels. The bathroom has a spa bath to make the guest enjoy the services. The beds are comfortable and clean. The hotel is quiet although the hotel is situated on the main street. Breakfast was tasty and the staff was polite and friendly. Actually, I like the hotel for it is convenient and most welcoming. The surrounding environment is also good for tour services and closer to the City Centre. In conclusion, the best hotels are located at the heart of Bologna. These are the perfect hotels one should dream of visiting in life. They offer quality services to their guest and they have a heart of welcoming. When there, one feels at home away from their actual home. Venice has remained a top destination for tourists, who intend to make great use of their holiday and leisure time. This has been adversely contributed by the several islands Venice takes pride in, full of amazing and breathtaking sceneries, making your visit worthwhile. This disregarded Venice Lagoon was once ranked second in the most beautiful places list in the Forbes magazine in 2016. Though overlooked, this ranking confirmed its capability of attracting tourists. Any visitor to this less crowded area comes back with fond memories. The main contributor being its wonderful and colorful fishermen’s cottages. Once you arrive in Venice, simply take a water bus and in about 40 or so minutes you will be right in this amazing Island. It has a population of utmost 3000 people, who have settled in this densely urbanized island entwined by canals full of colorful fishing boats matching with the beautiful cottages. This small population will go a long way to sprucing up your visit. This island is not only highly attractive but also full of lacework. You can also visit Museo del Merletto a reliable museum in Lacemaking. This is indeed a perfect place for lacework enthusiasts. You won’t resist falling in love with the beautiful wooden roof terraces which have been strategically positioned to conform well to the sun and sea breezes during the islands hot days. If you need a nice place for sunbathing and late-night dinner, Burano Island is the place to be. Excellent delicacies are not a problem in this amazing island. Since it is a fish affair, Burano is packed with a couple of restaurants that provides various types of fish dishes for its tourists. Besides, there is Dolce and pasta which are a perfect delicacy. For lovers of new cuisines, you ought to visit this Island. By the end of your stay, you will have acquired some new recipes to try them back home. This Venice Lagoon island is a short water boat ride north of Venice. It is made up of 7 islands, separated by waterways which are larger than most of Venice canals. It has an estimated population of 500 people. Most people visit Murano because of the valuable glass factories that are ever pleasing, in order to witness the process of glassmaking. Some of the companies even offer free boat rides to lure these tourists into visiting their premises. You can visit the Museo del Vetro, which is a glass museum. Here you will get a view of some of the best ancient and amazing glass. Besides, there are several furnaces which are open for everyone to see. Murano has wonderful architectural designs that catch the attention of any visitor. These unique architectural designs have been applied on some of its ancient churches, for instance, Chiesa di San Pietro Martire, Basilica dei Santi Maria Donato. For lovers of amazing architectural designs, then Murano is the place to visit in a bid to get some rare feat in architecture. There are also some ancient mansions that have graced this island making it one of a kind. Some of these mansions include Murano Lighthouse that was built in 1912. In case you need some conducive peace away from the city, Murano is a place to visit. It is not densely populated thus you will not have to struggle with putting up with noise. As the holiday sets in, you can make reservations on visiting this amazing place. lthough it has been overlooked, this island is home to various attractive sights. It has lovely mosaics, impressive views that will ensure your visit is one to remember. Torcello was the first ever island to be considered as a home by the people who were escaping from the Barbarian Hodes. It is made up of sights that will spice up your stay in Venice Lagoon island. The Devil’s bridge was built in the 15th century and revamped in 2008. It is an amazing place to pass as you appreciate the elegance of Torcello architectural design and the masterpiece of the engineers that designed and built it. Having a photo of you taken from you, not only preserves some dear memories but is a sign of an excellent stay in Torcello. The Cathedral of Torcello is one of Torcello’s ancient monument. It was founded in 639 AD and renovated in 1008. This cathedral is well known for its 11th-12th century Byzantine Mosaics. However currently, it is no longer a cathedral because it lacks a bishop. Despite that, it is still an amazing place to look at. There are also famous restaurants that are Locanda Cipriani that serves as a nice place to eat and also accommodation. After eating you can take a stroll at the famous Archaeological Museum of Torcello. It is full of remains and fragments of famous 10 churches. Torcello will not only offer you amazing sights to look at but also a suitable environment to spend your holiday in. It is less crowded, just a perfect place to enjoy your holiday peaceful as you bond well with your family. This confirms the relevance of visiting less populated areas. Less crowded islands are undoubtedly some of the best places to visit. Not only for the amazing sceneries they have to offer but also the conducive environment they have. The Venice lagoon has such islands, that will give you that harmony and peace needed while on holiday. Murano, Burano, and Torcello are packed with amazing sights that tend to take away the breath of any visitor. As a potential visitor, you can begin planning your visit to these amazing and less crowded islands. It is a guarantee your visit will be worthwhile. A Unique Opportunity to see a Parmesan cheese facility in the Afternoon. This tour is a guided tour of a Parmesan producing dairy and it happens in the afternoon. We depart from Modena train station and we provide transport, English speaking guide, and a generous tasting. The tour lasts approx 1 hour. You would think February to be a pretty uneventful month. After all, the Holidays have just come and gone, so what in the world is left for me to see out there? If you’ve booked your trip to Italy and are finding yourself in Bologna during February, fret not – there is plenty to see and do. Aside from the fact that you could be about to experience a super-romantic Valentine’s Day with your significant other during your Italian Holidays, between fine wine, delicious dishes and the perfect spots around the city for a date, February is also the month that will see Carnival celebrations and parade get out onto the streets. While not quite as flashy as Brazil’s Rio de Janeiro world-renowned parade, in all cities of Italy you’ll be able to see wonderful and colorful displays of masks, costumes and fun activities! But first, let’s take a look of the traditional and regional treats that you’ll only have a chance to enjoy during the Carnival season. As you might have noticed, food is a very important part of Italy and its traditions. Food marks a convivial and festive moment, and Carnival is the perfect moment to enjoy a number of sweet and interesting seasonal treats and desserts (which also help to really get in the mood to celebrate). Sweets are a staple of Carnival so be ready to party to the rhythm of a sugar rush. The name of this deep fried ribbons of dough is widely discussed in Italy, since each region and province (or even city) calls them by a different name. Known to the English-speakers as “Angel wings”, the pastries are served with a generous dusting of powdered sugar. Optimal sfrappole should be crispy, while also melting in a sugar paradise in your mouth. You’ll find these and other seasonal sweets in most bakeries or grocers, which are also supplied by local bakeries so that each treat will be produced according to the tradition. Still deep-fried, still favored with a dusting of powdered sugar, the castagnole take their name from “chestnuts”. Not because it’s an ingredient, just because they’re round as a chestnut, golden and will fill you with energy. You might find these in a variety of types: with custard or chocolate filling, soaked in Alchermes liqueur or covered in honey. “Fritti” as in “fried”. This is another caloric treat that is sure to entice your sugar receptors. These pastries are truly a regional tradition and as such are a bit more complex and ingredients vary from bakery to bakery, from family to family. But mostly, they’re fried buns eaten plain or with a filling, and optionally a dusting of powdered sugar. Among the fillings you might find custard, home-made jams with raisins and such. Every tortello is a surprise! But remember, food stands at every corner also mean it’s a great opportunity to taste other dishes and savoury treats both seasonal and regional. So, now that you’re energized and ready to go out in the city, what is there to do in Bologna? Carnival will last from Thursday 23rd to Tuesday 28th of February, so here are the main parades and events to attend in cities around Bologna and in the city itself. The Carnevale di Cento, in the city of Cento (province of Ferrara), is among the most famous celebrations of Italy. As such, it’ll last from Sunday 12th of February to the 12th of March with samba dancers, food stands and catwalks and contests for the best masks. Most cities’ parades showcase floats decorated according to themes or pop culture, but in the city of Comacchio (Ferrara) the “Carnevale sull’acqua” will feature literal floats parading over the waters of the city’s canals on Sunday 19th an Sunday 26th of February. Don’t miss the seafood and fish delicacies, and the activities for children! To enjoy true traditional seasonal dishes and treats, you can pop by the Carnevale di San Pietro in Casale. The town in the province of Bologna will offer catwalks and parades of beautiful masks and plentiful food stands for every taste. If you’re more interested in seeing floats and buskers than masks and costumes, the Carnevale dei Fantaveicoli, an eco-sustainable parade in Imola that will take place on the 26th of February is the event for you. On the other hand, if you enjoy traditional and Renaissance-style costumes and the idea of a more historic re-enactment of Carnival parties from the 1400’s, be sure to check out the Carnevale Rinascimentale Estense from the 23rd to the 26th of February. No floats will welcome you, but just the wonderful costumes inspired to noble and historical figures of the city of Ferrara and it’s court. Buskers, jugglers and street artists will entertain you as you wait for themed events and shows to take place on the last day of Carnival in the Piazza Municipale. There’s plenty to choose from, and anything goes, as long as you can truly experience the exhilaration and festive atmosphere of Carnival with foods, entertainment and masks. Travel Agent Tip: How To Avoid a Poor Deal For Your Travel Money. What is the best way to get travel money and how do I avoid getting a poor deal? Preparing to go on holiday can be a stressful time. Deadlines to meet, clothes to wash and bags to pack – there’s lots to think about. One thing that often gets left until the last minute – but never gets less important – is sorting out your holiday money. Getting it isn’t difficult, but knowing where to go for a good deal is. So we’ve done a bit of research and put together a guide. Follow this and avoid any nasty financial shocks when you get home. Never exchange money at the airport. This is a super-easy rule to follow: Simply don’t use bureaux de change at the airport to exchange your currency. Ever. It might seem like a convenient option, and it is, but the exchange rate is always horrible and at that late stage what other choice do you have but to accept it? Don’t be fooled by a sign that reads “0% Commission”, the fees are often hidden in a poor exchange rate. This is a good rule to follow in general: When a sign reads “0% COMMISION”, it’s usually too good to be true. Using your UK debit/credit is super-easy but can be super-expensive. Of course, you may get to the airport, see those poor rates and decide to use your UK card abroad. More and more travellers are opting to take their regular debit/credit cards away anyway. This is by far the easiest option and requires no effort whatsoever apart from packing your wallet. The thing is – you’ll often spend a considerable amount on fees. Let’s take a Halifax debit card, for example. If you were using your card in Rome – they would charge you £1.50 for each point-of-sale transaction and/or £1.50 for every ATM withdrawal. On top of that, a 2.75% conversion commission is charged each time. Costly. Of course, you could just do the exchange once you reach your destination. The problem is you’re still going to have to hunt around for the best rate. Spending the first day of your holiday scanning for the best deal doesn’t sound like much fun, wouldn’t you rather be having a glass of wine and picking at some olives?Also, what about paying for your taxi from the airport? Prepaid cards are usually the cheapest way. Prepaid cards are cards that you load up with currency before you go and use when you’re on holiday like a debit card here. Imagine a prepaid card is like a pay-and-go mobile contract. You can’t spend until you’ve loaded it with money but there are lots of benefits once you have. Like a pay and go – you can track exactly what you’ve spent and how much you’re spending. You can also ‘top up’ anytime. The rates are much better than most other options and unusually, rates are fair and transparent. The guys at Money Saving Expert know their stuff, they’ve reviewed all of the UK options. We really like WeSwap which is a prepaid card with a difference. Instead of buying money from a trader and selling to you – like most banks and bureaux do, WeSwap actually swaps money between travellers heading in opposite directions. Swapping is obviously much cheaper and therefore so is WeSwap. They noe have 200,000 travellers in their community and just raised over £2 million in crowdfunding. It very rarely pays to make the payment in pounds. This is due to the fact that the overseas vendor is making the conversion, usually at a less than favourable rate. In short, always select to pay in the local currency. If you’ve already swapped into Euros – which you will have done with a prepaid card – you don’t need the ATM to convert because you’ve already done it! This is just a way for the local bank to try and make some extra money. Don’t take a packet of cash, it’s not 1997. A surprising amount of people still nip down to somewhere like the Post Office or M&S, swap all their money and take it in their suitcases. Not only are these traditional providers often expensive – how often do you walk around with hundreds and hundreds of pounds in your wallet in the UK? Even if you hide a few hundred Euro under a mattress, in a ball of socks or inside the curtain it’s not exactly bullet proof. If it doesn’t get stolen, it is easy to lose and you’ exchange rate would have been poor anyway. Keep an eye on the markets and watch out for elections. It is worth keeping an eye on the FX markets in the lead up to your trip and bearing in mind the potential impact of politics. Two surprise election results had volatile consequences on the FX markets in 2016. Firstly, the British public voted to leave the European Union, and secondly the American public voted Donald Trump as their next president. Both of these decisions had a negative impact on their respective country’s currency. Basically, markets don’t like uncertainly and new leaders and political change often mean uncertainty. Shrewd travellers may have exchanged some money pre-election so as not to be affected by the result. Obviously this isn’t very practical but it helps to have a little knowledge of these things so you can make a measured decision. This tour will allow you to discover hands on how to make the perfect espresso, cappuccino and caffe’ latte. Participants will be visiting one of the most famous coffee maker in the province of Bologna and Modena, where they will take a one hour Italian coffee-making experience with a local trained barista. Following the coffee experience we will be visiting the Ice Cream museum in Anzola Emilia at the Carpigiani factory. Here you will be taking a guided tour with gelato sampling at the museum where you will learn the basic of gelato making. This tour also include a visit to a balsamic vinegar maker. Time: Leaving at 9.30 am and returning at 4 pm. Tuesday to Saturday, excluding Italian national holidays. Min. 2 adults. This is a private tour just for your group. Transport from Modena train station or Modena Hotel is standard. We can also pick you from Bologna however this is an extra, please see booking calendar for pricing. The Trattoria Anna Maria is a restaurant located in the historical heart of Bologna. The cozy and homely atmosphere definitely remind the customer of the history of the establishment, opened in 1985, and that of Bologna and of the Bolognese cooking tradition. The trattoria is furnished simply, so that the customers will be able to enjoy the high-quality and handmade dishes of the Emilian tradition of the city and they’ll be able to do so in a setting that welcomes interaction and merrymaking between the people seated at the table, as is typical during an Italian meal! The Trattoria Anna Maria prides itself in its selection of local dishes, perfectly in line with what a tourist might be looking for when choosing to sample traditional cuisine. For example, among the first courses served here we cannot fail to mention tortellini, tagliatelle, tortelloni with filling and lasagne, all made with ragù, the traditional meat sauce that accompanies most of the pasta-based dishes of Emilia-Romagna. Among the second courses offered by the trattoria, we have game, such as rabbit (which is a delicacy and a very savory dish that is highly recommended! ), guinea-fowl and capon dishes, and again duck or various cuts of pork prepared according to recipes handed down through the generations. The dishes I’ve ordered have all been presented somewhat simply, but that only contributes in avoiding distractions for the customer, who can then focus on the true tastes of Bolognese dishes. 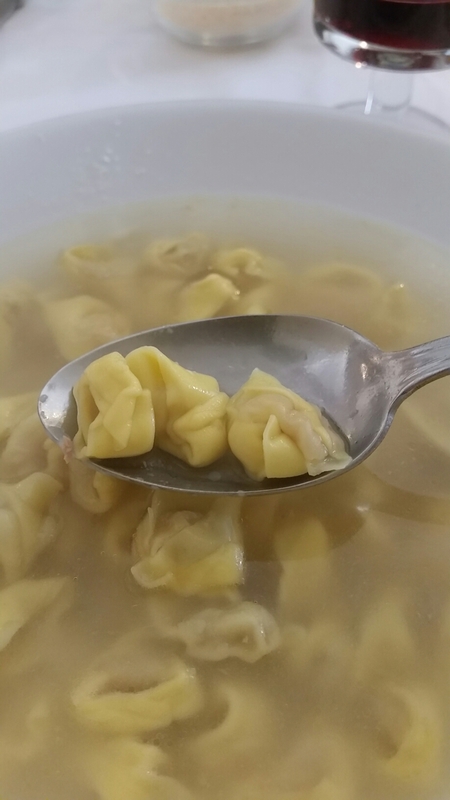 As the first course of my meal, I had tortellini with capon broth, different than regular chicken-stock broth as it’s more savory and genuine, according to the traditional recipe of grandmothers who prepared this type of dish for the Sunday lunch. The portion was generous and the tortellini were fairly good. Despite being famous for the first courses of meat-filled pasta, the meat-based dishes of the trattoria were especially well prepared and surprised me for their high quality. 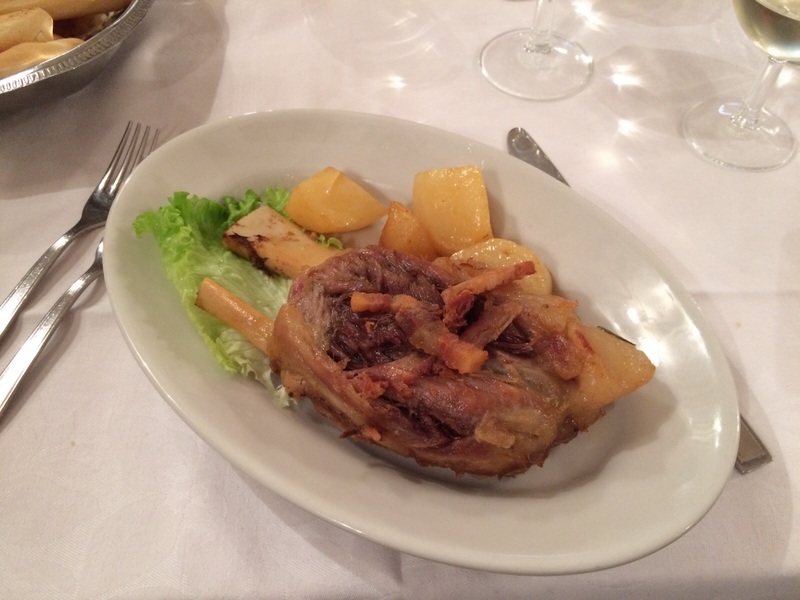 I ordered a roast of pork shin-bone, accompanied by a small portion of baked potatoes that was excellent. 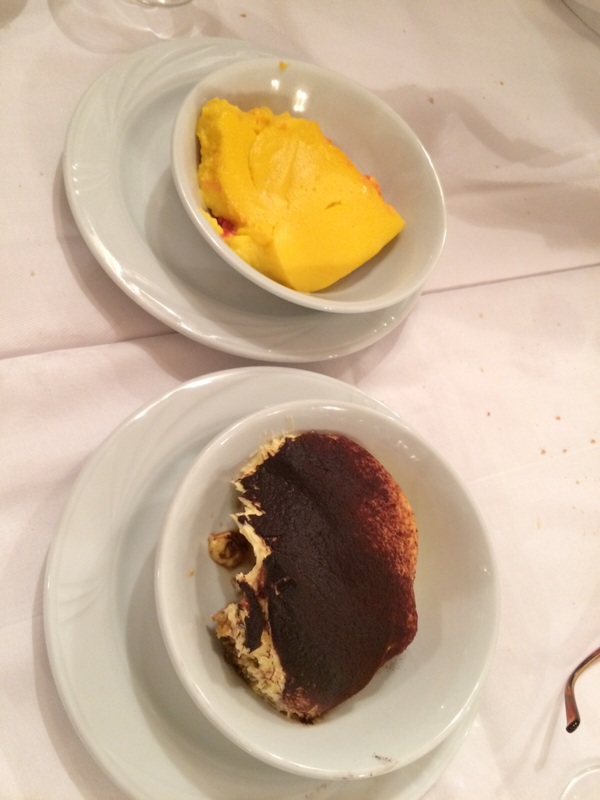 I’ve also ordered two typical desserts, a “zuppa inglese” and a tiramisu, both very good and served in generous portions. The prices for the first and second courses are medium-high, ranging between the 11 and 15 euros per dish. Considering the central position of the restaurant, this is a good price, and the quality to price ratio is very good. The Trattoria Aldina is a restaurant that offers traditional Emilian dishes, and it’s located in Modena inside a building that houses other businesses, so it’s actually quite easy to miss the entrance. But the restaurant, its address being Via Luigi Albinelli 40, is off the beaten path going towards the city center and as such it’s frequented largely by locals, which is all the more reason to dine here, surrounded by friendly staff and true, homemade local dishes. The atmosphere in here makes it so that it feels like you’re about to have a hearty Sunday meal at an aunt or a grandma’s house, and since the restaurant is on the first floor, the overall appearance of the place is that of a real Italian house. Booking is not possible unless you plan on dining here with a group of people, but it’s fairly easy to be seated – you might have to wait just a little while at most. The pasta-based dishes are excellent and 8 euros for a dish of tortellini in broth is truly a deal! The quality of the courses offered is amazing, especially when compared to the affordable prices. The ratio between quality and price is outstanding since the dishes of homemade fresh pasta with or without filling (tagliatelle, tortellini, tortelli, lasagne and more) cost only 7/8 euros. The dishes I decided to order and try are as follows, but the choice spans across most of the traditional dishes and courses of a typical Emilian meal, and it ranges from different kinds of pasta, filled pasta (with diverse and seasonal fillings to satisfy every palate), second courses of meats, including veal, and a choice of side dishes (baked vegetables, mashed potatoes and so on) and cheeses. I ordered a classic dish of tortellini in broth, a staple in the Emilian tradition, especially here in Modena, that proved to be excellent and affordable; as a second course, I strayed from the usual that would have customers order more traditional dishes such as pork shin-bone or tagliata, to order a horse meat tartare that was fairly good. As for what concerns the desserts, I tried both the excellent zuppa inglese (a trifle made with layered custard, chocolate cream, and sponge cake dipped in Alchermes) and the panna cotta with a red berries syrup that was quite good – the desserts available might change from day to day but the pillars of Italian cuisine are usually always on the menu, including tiramisu, mascarpone and more. 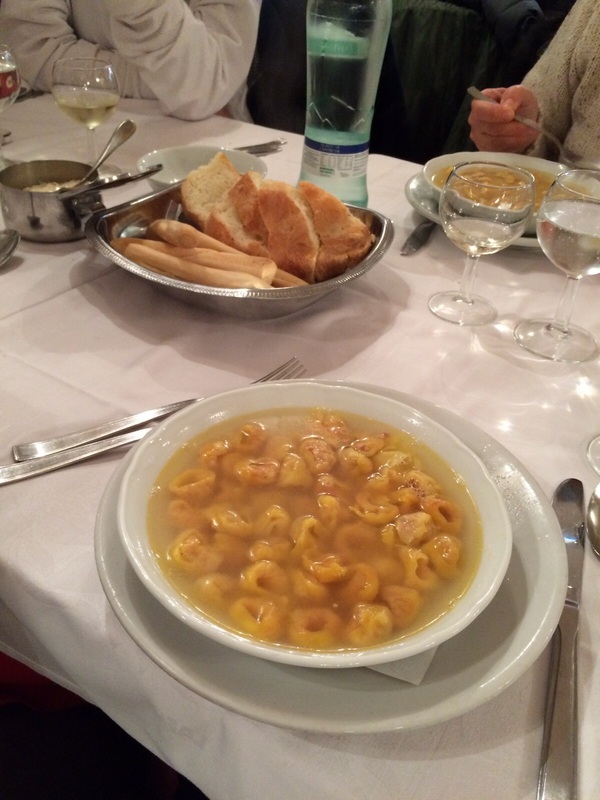 Great tortellini in brodo at Aldina’s – only 8 euros.